The private security industry is a continuous evolving industry in the UK and changes have always been challenging. The organization responsible for regulating the private security industry (SIA) has been issuing from April 2005 individual mandatory licenses lasting for 3 years to anyone who wants a security job. From 7 April 2014 business licenses will start being implemented, so businesses that provide security services in the United Kingdom will be required to obtain a SIA business license lasting for 5 years. From 6 April 2015, it will be a criminal offense for a business to provide security services without a SIA business license. Currently, security companies are assessed on voluntary bases by SIA with regards to the quality of their service supplied and granted (or not) Approved Contractor Status. Many businesses require their security suppliers to be an Approved Contractor. 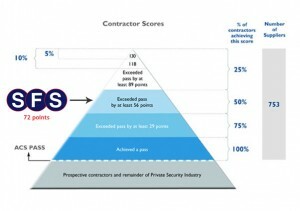 Each year every approved contractor is reassessed and obtains a score that compares it to other approved contractors. For SFS, the SIA Approved Contractor scheme was the opportunity to distinguish ourselves as being in the top half amongst 753 of the best providers of private security services in the UK. We have always been turning challenges in opportunities, so the new business licensing program could have a positive impact on us. Small cash based security businesses that bend the rules will be eliminated and a fair amount of venues will start focusing towards trustful professional security companies. Having already all the standards required, we aim to be within the first security companies obtaining the business license in April. We are positive that this will open the way for expanding our business. SFS endeavors to bring SAFETY, SECURITY, PEACE of MIND & HARMONY to your professional environment.